Proper summoning of a creature from the outer valences requires the use of a "summoning circle". These circles are usually drawn on the ground, either in places of power or, if hastily needed, anywhere there is a flat surface. 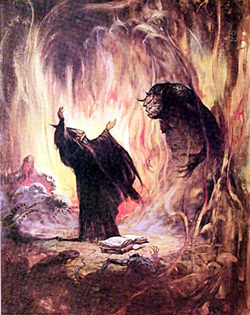 The circle itself performs several functions, most of which involve protecting the caster from the creature summoned, and is usually drawn with a dry chalk, wet paste, or possibly blood. Chalks and Paste are created from specific ingredients. The mixture of these ingredients can vary, and with that variance comes chalks with different properties. Chalks have several properties, the main being the ability to allow the summoner to channel sufficient energy through the fabric of the material plane to pull a creature [sometimes specified by the circle itself] from the outer valences. + Crush the gems into a fine dust. It will take from 3 to 5 gems to make one measure of gem dust. + Separate the herbs into single portions, it will take from 3 to 5 individual herbs to make one measure. + Into a cauldron, or large pot, mix the gem dust, herbs, and potion. A proper mixture is 1 part each of dust and herbs, to 3 parts potion. + Boil for 5 minutes. + Reduce heat and allow the mixture to cool for 5 minutes. The mixture will thicken into a paste that can be spooned out either into a mold or simply left clumped on a surface, such as a table. The paste must now harden. Optional: At this step, prior to spooning out of the cauldron or pot, the maker of the chalk has the option of casting IMBUE on the paste. This will increase ability of the finished product to channel energy, thus increasing the chances of a successful summoning. Absorbency � Determines how much power that can be stored in the chalk. Resistance � Determines how much power is lost during the summoning process. Influence � Determines which circle magic is best tuned to this chalk. Stability � Measures the chalk�s stability during power transfer in summoning. Creation of the circle starts with the INSCRIBE verb. A simple circle will be drawn, using the chalk held in the right hand. The chalk used to inscribe the base circle is fairly unimportant, since it is the individual runes inscribed around the circle that change the properties. At this point the summoner has several choices as to how to continue. The summoning circle can contain up to two "rings" that can be used to inscribe runes into the circle�s diameter. These runes have special functions and are placed at specific areas on the circle [however this function is likely going to be automatic]. You�ll note that the inscribed circle looks much like a compass, but the "points" in this case don�t indicate direction. In fact they�re not required at all and are simply illustrated here as a guide. The more important points are directed along two major axes, one indicating Power, and the other Control. The secondary axes are primarily used to indicate specifics, such as exact demons to summon, just exactly what they�re to be used for, etc. In order to maintain balance, the inscriber will want to be careful which runes he/she places along each axis. For instance, inscribing runes along the power axis that define the strength of the demon to be summoned can be hazardous if the inscriber forgets to place similarly powered runes on the opposite end of the axis [along the circle] that are meant for defense and protection. The control axis is extremely important because it not only dictates what the demon CAN do, it also dictates what it CANNOT do. If the inscriber forgets to include runes dictating the demon�s actions against the caster, then he or she may be in dire need of a cleric very soon. Again, the secondary axes allow the caster to direct specific criteria to the outer valences when the summons is cast. This specific criteria will define exactly which demon is called, what it is likely to do when summoned, and which criteria must be met before it is released. Remember that the circle above illustrates a well balanced example, however it may not be necessary to follow this guide strictly. An inscriber may, for example, inscribe all power runes around the circumference of the outer sphere and ignore the inner sphere and secondary axes all together. What this would produce would likely be a demon of significant power but leave no way for the summoner to control that demon, nor any specific criteria for the demon to follow to allow release. Such a summoning would likely end in disaster for the summoner [and quite likely the nearby surroundings] as the demon would be in control of the situation and dictate its own terms for release back into its own plane. This illustration shows the "Universe" as we know it indicated by the smoky area in the middle of the picture, with a series of spheres extending outward in a seemingly ordered pattern. These spheres illustrate the "outer valences" and show likely positions of demonic planes surrounding the material universe. The valences shift and undulate constantly with no real order. This shifting is brought about by a collection of forces acting upon the inhabitants of the valences, including but not limited to Life acting upon Unlife, Positive acting upon Negative, and Chaos acting upon Order. These forces push and pull at each other constantly, causing specific layers of surface tension to be created at ordered power levels. Thus the outer valences become inhabitable planes. In essence, what a summoner is doing [with the aid of a circle] is to punch a whole through one ore more of those layers of surface tension to either forcibly remove a creature [demon] from that plane, or to call a specific type of demon to do his/her bidding. This is usually at great personal risk, since all demons hate life, and their existence in the material universe is usually not by their own will. This ends the circle creation document. For more information on the demon project in GemStone III, please visit the bulletin boards and look for the Demons topic under the Sorcerer�s category. Provide a new species for GemStone III that can be enjoyed by all players. Construct additions to key systems such as combat and magic that specifically handle the new species. Develop a system for summoning, control, and banishment. Create areas outside the current "world" that are inhabited mainly by the new species. Clerics � Secondary summoning class, secondary banishing class. Wizards � secondary controlling class. All other � Variable depending on skillset. Levels vary based on surface tension and distinct energies available at that level. Creation of summoning circles. Steps to create. Summoner can either be in the circle, or out of; allows the demon to move freely. Release of demon / banishment. Methods of travel to/from the planes.